There you go tugging at my heartstrings again. You know that I absolutely love Marfa and the work of Donald Judd. The space above is stunning. The light is incredible when standing inside and the color of the wood is reminiscent of rays of sunlight. 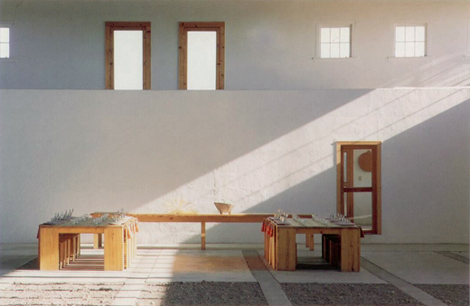 PS - I am looking at "Chinati - The Vision of Donald Judd" on our coffee table as I write this. And dreaming of our next trip to Marfa. It is weird to be away from Texas. jen - i totally thought of you when i wrote this post! :) that judd library site is amazing!!! didn't know your friend designed it - thanks for the link! "chinati - the vision of donald judd" is on my list... i'm allowing myself to purchase one book per month only, so that list is pretty long, LOL!